Virtual Bass Amp, Software Amp Simulator from Studio Devil. 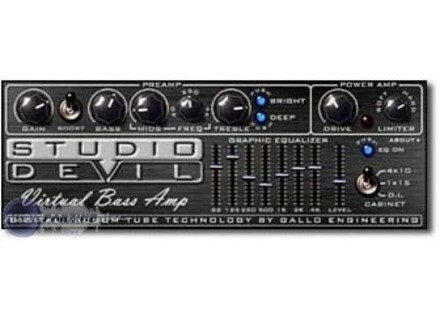 Gallo Engineering has updated Studio Devil Virtual Bass Amp (VBA) to v1.2. Addresses some stability issues on the Windows ProTools RTAS version. Other users of Mac, Audio Units, or VST versions of Virtual Bass Amp will not see much difference, but are encouraged to upgrade anyway. AudioSpillage DrumSpillage AudioSpillage has announced DrumSpillage, a new drum synth AU plug-in for Mac OS X. Expert Sleepers Updates Augustus Loop 2 (AU) Expert Sleepers has updated the AU version of Augustus Loop to v2.2.1. Jam Genius iPhone App The new 'Jam Genius' iPhone app is designed to provide "a unique approach to improvising music."